The winegrowing district Carnuntum is a region located south of the Danube River in the state of Niederösterreich (Lower Austria), and extends eastward from near Vienna toward the Slovak border. 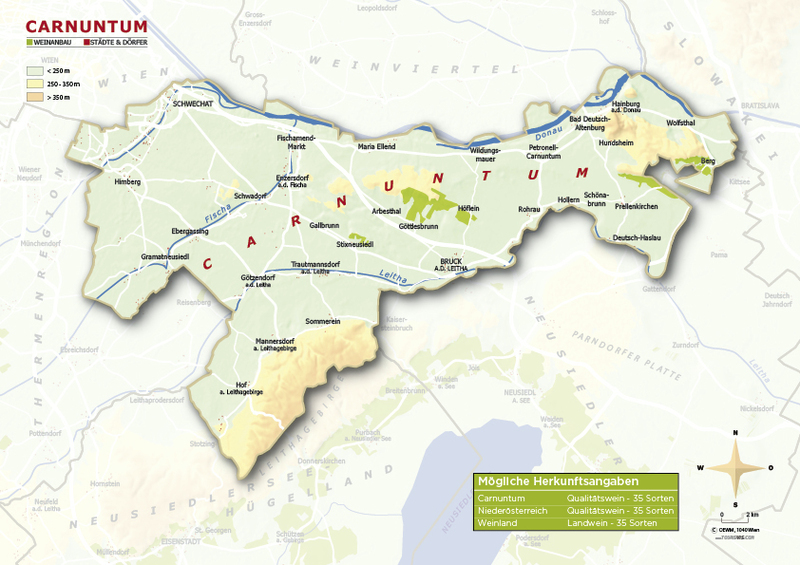 Carnuntum’s vineyards are spread out over three undulating landscapes: the Leithagebirge (the Leitha Range), the Arbesthaler Hillsides, and the Hundsheimer Mountains. 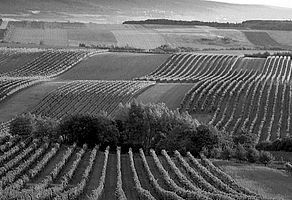 Stony limestone and loess soils work together with the Continental-Pannonian microclimate and the climatic influence of the Danube to generate the ideal conditions for wine production. The ‘Pannonian Climate’ is a specialised local variant of the Continental Climate. The centre of the European continent is essentially characterised by extremely hot summers and very cold winters (in stark contrast to the European coastal regions, which thanks to the moderating influence of the seas show a less dramatic temperature differential between the seasons). The Pannonian climate zone in central Europe enjoys a slight moderating influence exerted by the great surface area of Lake Neusiedl. Carnuntum, in turn, has a special place in this department because it is separated from Lake Neusiedl by the last foothills of the Alps, known as the Leitha Range, so that despite the relatively close geographic proximity there are indeed significant differences in temperature and rainfall observed between Carnuntum and the winegrowing regions clustered around the lake. Additionally, Carnuntum derives a definite cooling effect from the Danube wetlands, while warm and dry wind masses flow through the Brucker Pforte (the trench between the Alps and the Carpathians) from the southeast into the region; these often serve to fend off precipitation coming from out of the west. These various aspects work together and bring springtime to Carnuntum while metre-deep accumulations of snow still prevail in the Alps. So the grape vines are able to blossom early and enjoy a comparatively long vegetation period. While the first hot spell oftentimes hastens the budbreak, this is frequently followed in early summer by heavy rainfalls, which give the vines a good basis for making steady and secure progress through the region’s extremely dry and warm – sometimes very hot – summers. In most years the dry weather persists well into the autumn, so that Carnuntum enjoys the ideal conditions for growing late-ripening red wine varieties as well. The basic geologic/morphologic framework of the region is formed by the Leitha Range to the southwest and the Hainburger Mountains in the northeast; between them lies the Vienna basin, which itself features the Danube Lowlands, the Arbesthaler Hillsides, the Leitha Lowlands and the Prellenkirchen Meadowlands. The latter of these follows a former riverbed of the Danube, wending its way across the Brucker Pforte from the Vienna Basin to the Pannonian Basin and the Lesser Hungarian Plain. The Brucker Pforte functions as a causeway from the Alps (which include the Leitha Range) to the Carpathians, whose southwesternmost foothills are the Hainberger Mountains. [Translate to englisch:] Lange Tradition prägt das Weinbaugebiet Carnuntum. Seit den Kelten wird in dieser fruchtbaren Landschaft Weinbau betrieben.